So I had a winter dilemna. My boots from last year were looking really pathetic. Let’s just say they had seen better days. So, do I buy the same pair over again or do I try something new? I bit the bullet and decided to try out a new pair. I knew I would be pretty critical because I've had my old ones for a while and I liked them. The Cushe IT Boot Cuff is what I decided on. I love that these boots have been not only warm, comfortable and extremely lightweight, but they're also cute. They have a little bit of arch support (that my other boots lacked) and reach about mid-calf. They’re are made of water resistant pig suede with some knitted wool gusset and lambs wool down the side. The outside has rubber along the edge for protection and I have to say, they are much more water resistant than my previous boots. I can run errands all day and play in the snow with my kids and they stay fairly dry (unless of course it’s one of those really warm winter days when snow is melting everywhere. But on those days, nothing stays dry). These boots are considered a "pull-on" boot, which was on my list of "musts" because of my many, many trips in and out of the house each day fulfilling my role as taxi-mom. These boots also have a tie, and I know this sounds silly and somewhat petty, but it takes me about 30 seconds longer to put them on because I have to tie them. BUT…the style definitely makes up for that. Upper Material: Water Resistant pig suede with knitted wool gusset. 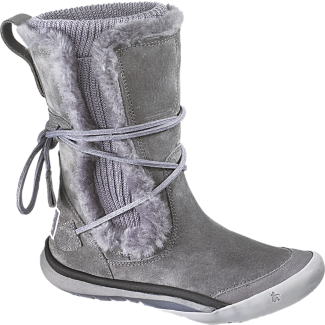 Fastening and Closure: Pull-on mid calf boot. Toe protection: External rubber toe bumper. Last: Anatomical last shape for a natural fit. Outsole: Molded Phylon EVA outsole with unique rubber toe cap.